The Nasdaq has broken out to new multi-year highs, but this may still turn into a false breakout. We start seeing a large rising wedge in the Nasdaq. Major overhead resistance is now just below 5100, with support at 4900. We are about to start a new lunar red period, so we will probably get a pullback or a pausing market in the next couple of weeks. But sooner or later we are to get a breakout, up or down, and that will probably set the tone for the rest of the year. If this wedge gets broken to the upside then look for the Nasdaq to climb to 6000+. 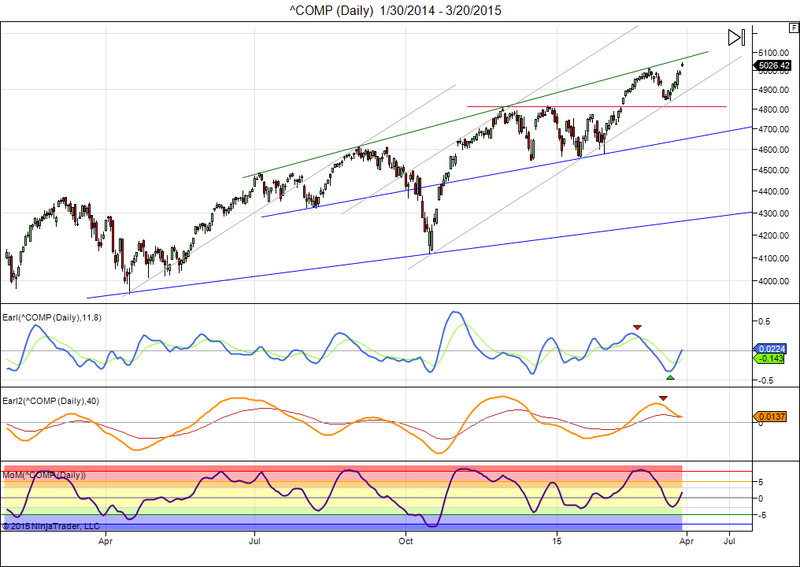 If it goes the other way, then prepare for a rather sharp drop that would take the Nasdaq to 4000-4200. This is a major crossroads. Technically the Earl (blue line) and MoM indicator are going up from recent lows, but the Earl2 (orange line) is languishing and that’s a warning sign. We risk getting rather large bearish divergences if the current rally stops below 5100. What may trigger such a breakout move is something I don’t know. But as an old friend used to say: “When the market is ready the catalysts will appear.” All we can do is keep our eyes open and go along with what comes along. I am preparing for next week’s post and want to use a little poll I have set up. Feel welcome to enter your vote on this question: “How often do you buy a stock that is at record highs?” The link to the poll is here: http://www.easypolls.net/poll.html?p=5507ee16e4b0a63961cbbd23 Thanks for participating. Next week I will give my comments on it. This entry was posted on March 23, 2015 at 9:32 am	and is filed under Financial Astrology, Market Commentary. Tagged: lunar cycles, poll. You can follow any responses to this entry through the RSS 2.0 feed. You can leave a response, or trackback from your own site.